I'm on a mission! My mission is to have more creative moments with my family and I'm excited to join other moms across America who are doing the same. Thanks to Scholastic and Kellogg's® Frosted Mini™ Wheats "Every Day is a Big Day" program, you have the opportunity to earn FREE Scholastic books and enter into a sweepstakes which helps give back to your community. Free books, family fun, and good memories... will you accept this mission? For October, our mission is to have "Creative Moments." Scholastic and Kellogg's® Frosted Mini™ Wheats is encouraging families to let their creative side shine. They wanted us to engage in 4 creative pursuits as a family - design, decorate, bake, write, etc. which is exactly my kind of fun. One of the activities we completed, as part of this mission, was making a worm home at a local farm. My 5-year-old and I spent a special morning together learning all about the red wigglers and what they need to flourish. I'm not very keen on touching the worms, but luckily he thinks they're pretty cool. 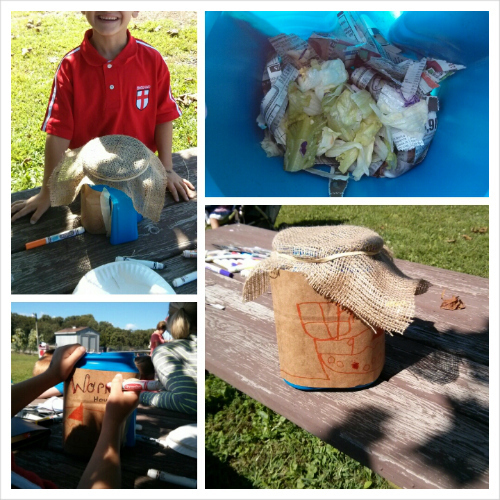 We used an empty coffee container, filled it with some strips of newspaper, some dirt, old lettuce, and the worms. Then, we spritzed it with some water and put a little dirt in there. Once that part was completed, we covered it up with burlap and let the worms do their thing. Sometimes, it surprises me how much my kids know, and little experiences such as building a worm house, really feeds their thirst for knowledge. Everyday, they want to learn more about the world, but as much as I teach them, it continues to amaze me how much I learn from them. Naturally, there are moments when my kids drive me crazy, but magical moments and special mornings getting crafty together make it all worth it.